Tokyo’s Nihonbashi district, a key business area within central Tokyo, is currently undergoing aggressive redevelopment with an aim to establish the area in proximity to Tokyo station as a life science and pharmaceutical hub attracting both domestic and multinational companies. 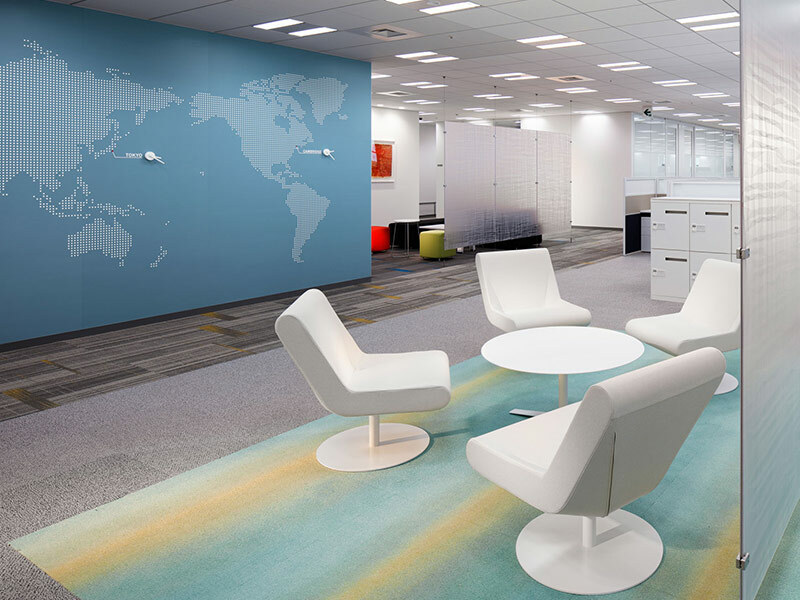 After undergoing a tremendous work style transformation in their newly constructed flagship campus in the US under Ed Dondero, Director of RE&Planning of Biogen, a similar process was foreseen for their operations in Japan to improve the working environment. 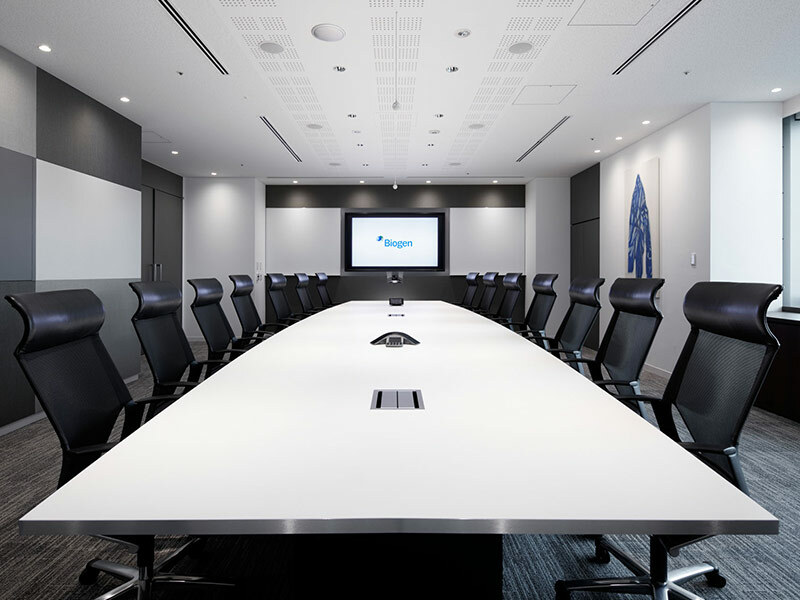 To this end, SL+A was tasked with the Interior Design and the Change Management for their new office in Nihonbashi, Tokyo. The goal of the exercise was to integrate elements and findings of Biogen’s US campus with local cultural requirements and survey results gathered from Biogen Japan employees. With the great support of Sho Oshikawa, Vice President, Pharmaceutical Operations & Technology Japan and Asia Pacific Distribution, and Ryosuke Arai, Associate, Office Management, SL+A interviewed business unit managers and held several workshop sessions with representatives of each BU. Users who had been hesitant of change at first gradually embraced the new work style concept built around a variety of focus and collaboration settings. Presentation of best practice examples by SL+A and the findings of workshops identifying the future vision of Biogen Japan shaped the road map for the design of the project. A key issue that needed to be addressed was the implementation of a workplace complementing the employee centric approach of Biogen, “One Team, One Biogen”. Biogen is a global American biotechnology company based in Cambridge, Massachusetts specializing in the discovery, development and delivery of therapies for the treatment of serious neurological, autoimmune and rare diseases to patients worldwide. A delicate balance between privacy and transparency, individual and communal spaces and aspects of branding were all of equal importance. With the workspace designed around the notion of allowing employees the choice of work environments, downsizing workstations, lowering the desktop partitions (“I” space) and providing more meeting rooms and collaboration spaces (“We” space) allowed employees to further embrace the company ethos. These measures also promoted an increase in communication and transparency with management staff. The colour concept is well refined. Clean, crisp colours convey a professional image of a biotechnology company acting at the forefront of the industry. An interactive animation developed especially for the project is seamlessly integrated into the reception branding wall supporting the advanced and scientific culture of Biogen. 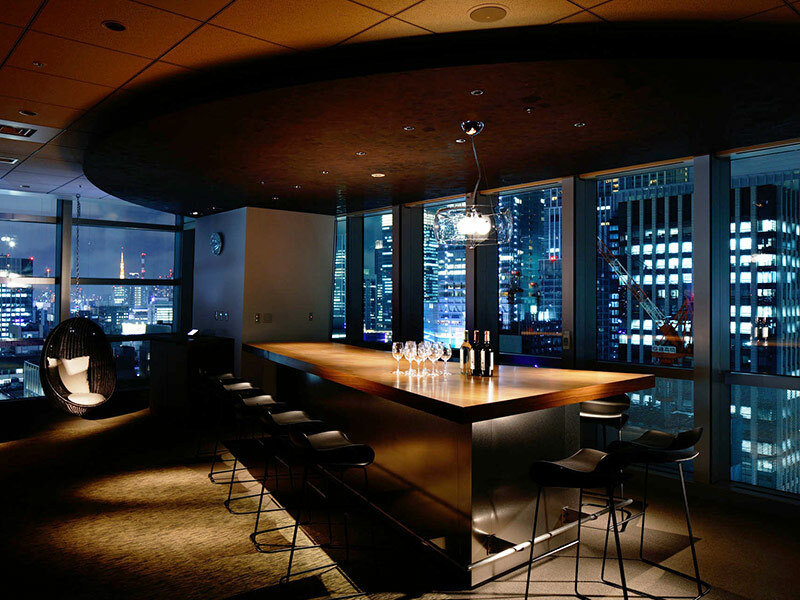 Sho Oshikawa led the project for Biogen with numerous constructive ideas, the most unique and bold of which was the realization of Sho’s bar, a communal space where a night view Tokyo can be enjoyed. 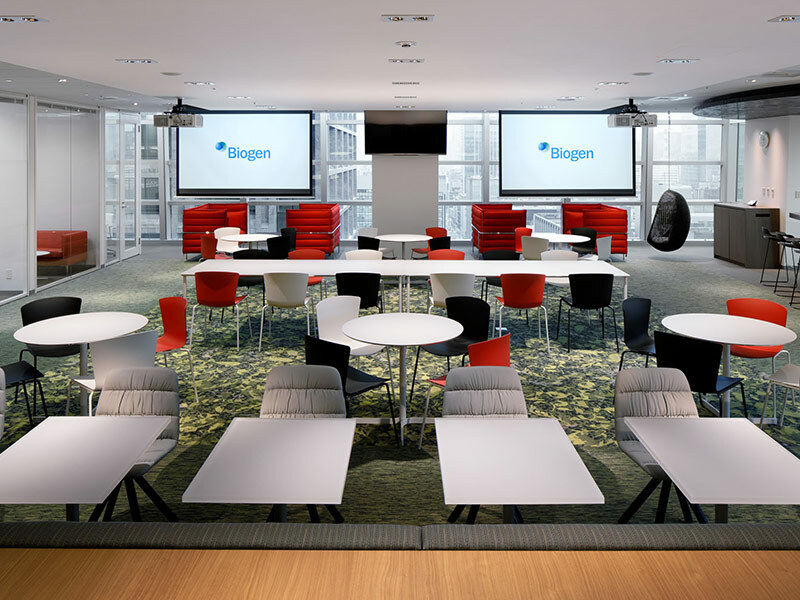 The bar, located within the working café has become the most popular spot for current and potential employees, a tangible example of the warm and innovative culture of Biogen. “Workplace creation together with employees” requires additional time and consultation cost but the outcome of increasing productivity and an embracing of organization ethos transformation is worth the effort. Having embarked on this exciting design journey with Biogen, SL+A are proud to have accomplished their goal…… ultimate user satisfaction.